TEDxLive is an extension of the TEDx program, launched by TED in 2010. TEDxLive events are TEDx events built around the live webcast of TED Conferences. TEDxLive events enable TED enthusiasts all over the world to experience live sessions of the TED Conference; events can be simple viewing events, and may also host live speakers. Renowned Talha Iqbal will also have a session at TEDxMazarEQuaid and Bilal N.Sabtain will share his w...orth spreading Ideas! Recommended Colors to Wear: Red,Black,White or combination of it. Please use the form below to register for the Live Simulcast of TEDGlobal. The registration does not guarantee that you would get an official invitation. This is FREE event but a closed one only invited people can attend it. 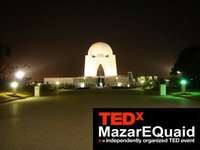 Soon short-listed participant will get a confirmation e mail but before that you all can grab your TEDxMazarEQuaid Badges which you can attach on your Dps. Just follow the link below and there you will find a button"Add to profile picture" tht's it you have done it.Your badge is attached with your Dp.